2019 may very well be marked as a turning point. For the first time in five years same-store sales are stable (versus declining), break-out e-commerce brands continue solidify their positions of growth by opening physical stores, and as retailers turn to their previously under-capitalized fleet of stores (after-all, they were investing in the big growth of ecommerce when 90%+ of their sales still happen in stores). Success stories like Target, which invested $7BN in 2017 into capital improvements, are encouraging other retailers like Ulta, Home Depot, and more to follow suit. (For any haters/mathematicians, while the absolute square footage of retail closures is still closing at a notable pace because of big brands like Bon Ton, Toys”R”Us, and others shuttering their doors – it’s the continued results of a consumer flight to quality). But the reality should be, well, different. When considering deploying retail technology your team’s decisions should center around one singular ideology: human interactions have to come first, and technology should come second. And that technology, by the way, should beautifully integrate into authentic store experiences. Consumer expectations are still out-pacing a lot of the retail experience of today. The retail market itself is on the cusp of massive change as it sprints to meet these demands. In this white paper, discover ways to thoughtfully execute retail-technology solutions that enable experiences that delight customers, empower associates, provide unprecedented analytics, and measurable sales growth. Are You Ready for 20-30% Lift Ticket? Scottsdale, AZ (October 2, 2018) – World-class kiosk manufacturer ZIVELO (best known for providing kiosks to McDonald’s across North America) is proud to announce the completion of a Distribution Partnership with BlueStar to streamline the company’s ability to meet increasing demand. Founded in 1929 with a network of over 12,000 value added resellers, Bluestar is a leading global technology distributor of a variety of solutions, including Point-of-Sale, ADC, RFID, Digital Signage, kiosks, and more. ZIVELO, a public computing technology company that offers self-service kiosks and digital signage solutions to multiple key industries, is poised to leverage this best-in-class partnership to meet the needs of the Channel. “With rapidly growing demand for ZIVELO from the Channel, we are pleased to announce our strategic distribution partnership with BlueStar. Channel partners will now be able to leverage BlueStar’s best-in-class distribution capabilities to provide ZIVELO’s full-service turn-key solutions to their clients” says Ryan Lagace, ZIVELO’s VP of Strategic Partnerships. With BlueStar’s strong purchasing power and global distribution capabilities, ZIVELO looks to improve efficiencies and meet demand in their robust QSR and Retail verticals, while expanding verticals such as banking, healthcare, hospitality, many more with our new Value Added Reseller (VAR) partners. For more information about ZIVELO, visit www.zivelo.com. ZIVELO’s mission is to revolutionize the way brands use technology to interact with their consumers on-premise and in the physical world. Founded in 2008, ZIVELO has rapidly grown to become the leading self-service technology brand offering a sleek and sophisticated product design, intuitive user experience, and cutting-edge modular hardware solutions. In 2018, ZIVELO acquired Oak Labs, the creators of OakOS – the world’s first operating system for public computing experiences. Through the acquisition, ZIVELO now provides brands with an end-to-end solution for the roll-out of kiosks and digital signage, including hardware, sortware, services, and financing. ZIVELO is headquartered in Scottsdale, AZ, with offices in San Francisco, CA and Seattle, WA. For more information, please visit http://www.zivelo.com/. BlueStar is the leading global distributor of solutions-based Digital Identification, Mobility, Point-of-Sale, RFID, Digital Signage, and Security technology. BlueStar works exclusively with value-added resellers, providing them with complete solutions, business development and marketing support. The company brings unequaled expertise to the market, offers award-winning technical support and is an authorized service center for a growing number of manufacturers. BlueStar is the exclusive distributor for the In-a-Box Solutions Series, delivering hardware, software and critical accessories in one bundle with technology solutions across all verticals. For more information, please contact BlueStar at 1-800-354-9776 or visit www.bluestarinc.com. This article reprinted with permission from ZIVELO. Click here for complete article. If you are considering implementing kiosk or digital signage options in your business, the number of details and logistics to navigate and manage can be overwhelming. Large Scale Deployment Considerations. Hiring internally to manage these processes would be time-consuming and expensive, and other manufacturers don’t offer world-class customer service and account management from discovery to post-deployment like ZIVELO does. We pride ourselves on our consultative approach, and the experience we bring to the table, having successfully deployed thousands of kiosks at a time to notable brands around the country. ZIVELO is more than a kiosk manufacturer. With software, hardware, and services options, we’re truly a one-stop-kiosk shop. WHAT GOES INTO A LARGE-SCALE KIOSK DEPLOYMENT? Account Management: ZIVELO’s Account Managers are subject matter experts on the product as a whole including product support, production, and processes necessary to institute a successful kiosk deployment. We take point for all aspects of deployment, ushering your company through each and every step of the kiosk design, ordering, deployment, and integration process. Software: Compelling user experiences are driven by software working in harmony with hardware, and we understand the best practices that go into successful software creation for every unique use case. Whether our clients have their own software solution, want to work with a third party software developer, want our software team to develop a platform for them, or want to build their kiosk software on OakOS, we plan and strategize with them every step of the way. Innovation Lab: ZIVELO’s Innovation Laboratory consists of in-house experts who are responsible for conceptual design and monitoring of our products to align with current and anticipated kiosk industry standards such as ADA regulations, ergonomics, and overall ease-of-use. Hardware: Choosing the right hardware to go inside and run your kiosk is extremely important. ZIVELO maintains relationships with many hardware partners so we can always source the best component for your use case for the best commercial price available. Learn more about what makes our kiosks so different here. Engineering: Each product release from Engineering is thoughtfully designed, boasting key modular features to allow for ease of serviceability and component upgradability for years to come. We specifically engineer each kiosk chassis to house universal bracketry for major components which allows for integration of components of various form factors without modification to the enclosure. The ZIVELO engineering team works closely with nationally accredited safety certification labs to incorporate key design elements and engineer our kiosks to be compliant with these safety standards. We primarily certify our units to comply with UL 60950-1 and CSA 22.2 standards which cover both the United States and Canada. Manufacturing: While in manufacturing phase, the product truly comes to life through both initial production level prototypes as well as final production or large-scale product deployment. Through ZIVELO’s refined manufacturing process, we employ robotic welding, laser cutting, turret punching and component integration, and rigorous quality assurance and validation testing. Plus, learn more about how our multi-phased approach to manufacturing reduces risk here. ZIVELO’S SIMPLE, SINGLE-SOLUTION HANDLES ALL OF THIS FOR YOU! READY TO GET STARTED? CALL 877.243.9519 TODAY! 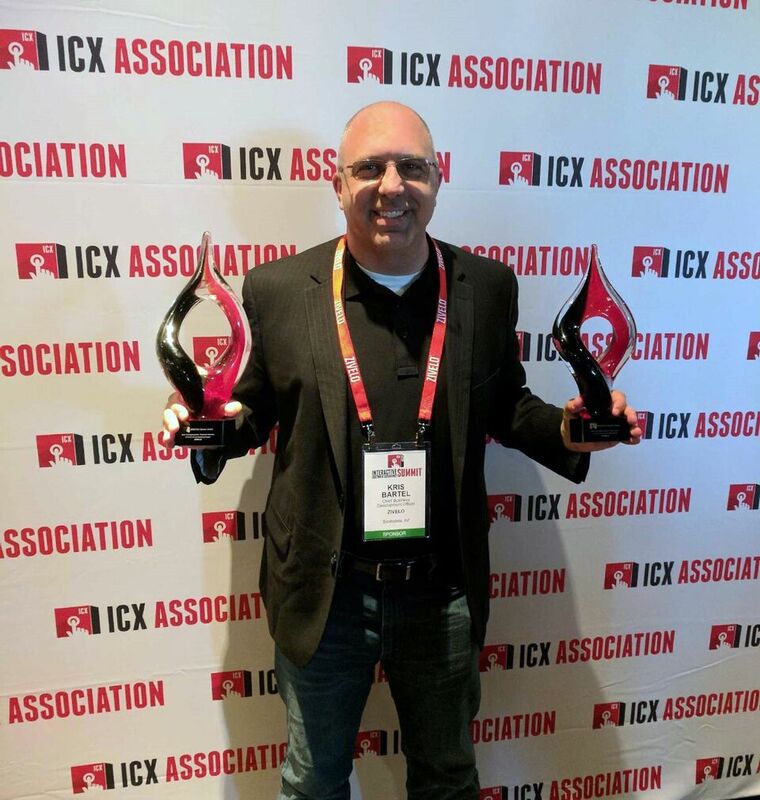 ZIVELO Wins 2 Awards at ICX Summit for Achievement in Interactive Customer Experiences. Dallas, TX – June 13, 2018 – ZIVELO, the leader in interactive self-service kiosk and digital signage solutions in the QSR arena, has been appointed to receive two prestigious awards at the ICX Summit in Dallas on Wednesday, June 13, 2018. The Elevate Awards honor the individuals and organizations that are pacesetters in using technology to elevate customer experience. ZIVELO will receive Best ICX Deployment: Restaurant and Best ICX Deployment: Financial Services at this year’s ICX Association Elevate Awards for providing nearly 10,000 kiosks to one of the top three QSR’s in North America, and for their groundbreaking virtual banking expert kiosks deployed at a top US-based financial institution. ZIVELO produces award-winning, self-service kiosk and digital signage solutions for a portfolio of global companies. This includes the top three fast food chains in the nation, as well as top brands across the retail, banking, healthcare, restaurant, and hospitality industries. Their newly launched software product, OakOS, allows ZIVELO’s customers and third-party developers to rapidly build and deploy applications with the only developer kit designed for kiosks. Clients can now develop fully-functional applications within days, by using OakOS’ comprehensive web-based frameworks and SDK. Backed by ZIVELO’s network of support technicians, this comprehensive offering removes previous common barriers in the industry. ZIVELO’s mission is to revolutionize the way brands use technology to interact with their consumers on-premise and in the physical world. Founded in 2008, ZIVELO has rapidly grown to become the leading self-service technology brand offering a sleek and sophisticated product design, intuitive user experience, and cutting-edge modular hardware solutions. In 2018, ZIVELO acquired Oak Labs, the creators of OakOS – the world’s first operating system for public computing experiences. Through the acquisition, ZIVELO now provides brands with an end-to-end solution for the roll-out of kiosks and digital signage. For more information, please visit http://www.zivelo.com/. Many restaurants in the industry begin their self-service technology journey with a pole-mounted tablet solution. However, these solutions don’t significantly disrupt consumer behaviors to increase ticket size and ROI. Additionally, they break down easily, the entire unit has to be replaced when this happens, and this solution is often scrapped in order to deploy a new product set at significant additional cost. Below we have outlined just a few of the benefits of our large-screen solutions, with durable commercial-grade components, the ability to update and repair individual units thanks to our modular design, and more. Plus, all of our product footprints can be adjusted to fit any size and space while still leading to greater ROI than other smaller screen solutions. It’s time to discover the ZIVELO difference, and rely on our experience successfully deploying thousands of kiosks to the top QSR’s in the nation. Are you ready to work with the best? San Francisco, CA and Scottsdale, AZ – May 15, 2018 – ZIVELO, the Scottsdale-based public computing technology company that offers self-service kiosk and digital signage solutions, today announced it has acquired Oak Labs, Inc., the San Francisco-based software company best known for its interactive retail technology, powered by OakOS. This acquisition positions ZIVELO as the first interactive experience provider to now offer a comprehensive suite of powerful software development tools on top of its proven hardware product line and services offering. Healey Cypher, co-founder & CEO of Oak Labs, will be the new CEO of ZIVELO and Ziver Birg, founder & CEO of ZIVELO, will serve as Executive Chairman. ZIVELO will continue to produce its award-winning, self-service kiosk and digital signage solutions for a portfolio of global companies. This includes 3 of the 5 largest QSR’s in the nation, and top brands across the retail, banking, healthcare, restaurants and hospitality industries. With OakOS, ZIVELO’s customers and third party developers will now be able to rapidly build and deploy applications using the only developer kit designed specifically for kiosks. Within days, clients can develop fully-functional applications using common web-based frameworks and a comprehensive SDK. Backed by ZIVELO’s network of support technicians, this comprehensive offering aims to remove the barriers that have previously challenged mass adoption of these technologies by brands and developers alike. Credence Research recently reported that the kiosk market is a $6B+ industry, and is poised to grow past $30B by 2025 as self-service technology adoption continues to grow across key verticals globally. Well documented business cases tie kiosks to 30% basket-lift, increased efficiency, enhanced data collection, and higher productivity per associates. ZIVELO’s mission is to revolutionize the way brands use technology to interact with their consumers on-premise and in the physical world. Founded in 2008, ZIVELO has rapidly grown to become the leading self-service technology brand offering a sleek and sophisticated product design, intuitive user experience, and cutting edge modular hardware solutions. In 2018, ZIVELO acquired Oak Labs, the creators of OakOS – the world’s first operating system for public computing experiences. Through the acquisition, ZIVELO now provides brands with an end-to-end solution for the roll-out of kiosks and digital signage. For more information, please visit http://www.zivelo.com/. PHOENIX (April 06) – ZIVELO designs, manufactures and supplies Virtual Banking Expert kiosks to some of the largest banking and financial institutions in the country. These kiosks provide business solutions such as connecting customers with Virtual Banking Experts that can handle complex financial services during and outside of branch hours, regardless of location and peak loads in branch traffic. These specially designed kiosks offer a way for financial institutions to connect with customers and provide services that may not otherwise be available within individual branch locations. Alternatively, some branches may have underutilized or over-extended staff depending on demand and day to day traffic. When kiosks are placed in high traffic areas they encourage interaction, and they can also be placed in dedicated, card accessed rooms that can be utilized by customers outside of regular business hours extending the bank’s hours via kiosk-based interactive remote banking staff. The technology behind the Virtual Banking Expert kiosks can be custom designed with touchscreen displays, HD cameras, motion detection, speakers, card readers, microphones, and more. ZIVELO’s unique patented modular design solutions make maintaining and updating kiosks with new technology low-cost and efficient, without having to ship or replace entire units. Segregated data paths are used to facilitate compliance with strict banking data security standards so that customer data is never compromised, even when wirelessly instigating videoconferencing capabilities. For more information on ZIVELO, and to learn how to pilot test Virtual Banking Expert systems, visithttp://www.zivelo.com/vbesm/.